Last week in this space I put forward a critique and a challenge to the Uniting Methodist movement. In response to their initial public appearance and the unveiling of their website I offered a simple criticism: there is no way forward without new theological vision. I noted the absence of scholars in the makeup of Uniting Methodists’ leadership team and observed that their platform constitutes a reiteration of the status quo. To my eyes they seemed like so many other centrist movements in our denomination: doomed to failure because of their pragmatic orientation, helpless to engage the passionate feelings and profound theological disagreements within United Methodism. Then, sometime later in the week, the theological statement of Uniting Methodists was unveiled. Suddenly, it seemed as though my exact criticisms had already been anticipated by the leadership of the movement. As I read through the document I was continually surprised by its seriousness, scope, and depth. Here was a heartfelt, thoughtful, and serious engagement with scripture and a faithful effort to bring the teaching of the Church to bear upon the struggles in our denomination. In my initial article I held up the Wesleyan Covenant Association as an example of a group offering a clear and new theological vision for the future of the church, but the WCA has produced no official theological statements comparable to the vision statement of Uniting Methodists. This vision statement shows that Uniting Methodists is serious about shaping a future for the United Methodist Church and not just “holding the denomination together” or keeping things like they’ve always been. Over the next few weeks, as I have time, I will be posting a detailed theological engagement with the vision statement of Uniting Methodists. This is not because I have signed on to their statement or committed myself to deconstruct it. I will be engaging with this statement because no other group proposing a vision for the future of United Methodism has offered such a rich and ambitious theological statement. The statement itself calls for conversation and is worthy of it. And anyway, if you write a blog post demanding acts of theological imagination you can’t just retreat back into your corner when they somehow actually materialize! Furthermore, HolyConferencing.org was conceived with a vision of bringing deeper and sharper theological analysis to the current affairs of United Methodism (you can read our Statement of Purpose here). Those of us who came together to form the site felt as though the usual level of discourse about our intra-denominational struggles was not only acrimonious (as is often bemoaned and acknowledged) but also absolutely lacking in theological rigor. In a spirit of charity, we set ourselves to doing what we could to address this deficiency and offer our denomination another sort of conversation. It is exciting to see others, more prominently positioned, who are concerned with a similar structural problem in our debates. We would be remiss in failing to offer both our praises and our criticisms for their venture. Because my focus will be theological, I will not take time to address the political practicalities of a movement like Uniting Methodists. Commentators from the traditional wing of the church are right to point out that it is unlikely to have the votes, judging by past precedent of similar measures, such as the “agree-to-disagree” amendment to the Social Principles at the 2012 General Conference. One may note in this connection that there are no Africans on their leadership team, even though all regions of the United States are represented. Because such questions are not my forte I will not address them in my engagement with the vision statement, even though they are of vital importance for the future of our denomination in general and the particular place of Uniting Methodists in that future. My engagement with the theological statement will unfold mainly in two modes. In these posts I will offer critique on the one hand and constructive explorations on the other. That is, some posts will consist in a minute working out of problems that I see in the contentions or wording of the document, while others will take the document as a springboard for further theological reflections. Both of these modes of engagement are necessary for fostering the new theological vision which is needed if there is to be a way forward for our denomination. If the reasoning of a theological statement is undermined by flaws or its wording marred by infelicities, then it cannot bear the weight which it must carry. And yet if it cannot spur both intuition and intellect to new epiphanies, further reflections, and deeper thought, then it will fail in the potency which true vision must offer. Is it sound? Does it inspire? These are my questions. Because many of my later posts will focus on details of the statement, I want to take some time now to offer a few general remarks and impressions. The first is this: Uniting Methodists’ statement is Biblical and it is Trinitarian. It is thoroughly orthodox—unless the only shibboleth of orthodoxy is a strict and exclusive adherence to the traditional teaching on homosexuality. It demonstrates a persistent claim of many who take a progressive stance on homosexuality: they embrace the catholic faith and are orthodox in their doctrine, departing from the tradition of the church only on this contested point. It shows no sign of the more radically progressive theology which traditionalist commentators are swift to associate with rejection of the inherited teaching on homosexuality. In particular the statement is eloquent in pleading for unity in itself. It sounds the old orthodox note (as old the apostle Paul and Ignatius of Antioch and Jesus himself) that unity in the church is a good in and of itself and schism in and of itself is an evil. While the church holds together institutionally, a space is created for us to love one another, forgive one another, and by the Spirit’s heart-transforming grace come to the true spiritual unity which binds our hearts in Christian love. Too often another note has been sounded, that there are some things beyond the sufferance of Christian brotherhood which demand a separation and delineation of the false Christians from the true. Although that other note has its place, Uniting Methodists is to be applauded for sounding clearly and distinctly the traditional plea for unity. Despite this persistent orthodoxy, however, the Uniting Methodists statement also displays certain unfortunate conceptual frames which are all too much of our moment. The statement relies heavily on the idea that there are two streams or two poles universal throughout the Christian tradition which must always be held in tension. This is a dangerous and inaccurate way of thinking. There are not two streams in the Old Testament, Christian history, or contemporary United Methodism. Rather, there is one stream—and there are far, far more than two. The body of Christ is a single loaf—and a cohesion of innumerable precious grains of wheat. It is eaten by a single mouth—and by a multitude which no one could number (Revelation 7:9). This is a point, perhaps, where the solely American makeup of the leadership team shows through. Ours is a nation which now more than ever can only imagine contentious issues in opposed pairs and where unity can only be conceived as a sort of truce or tension between two irreconcilable combatants. To use Adam Hamilton’s framing, we can only imagine black or white, and if we don’t like either of those, we have to live in the gray in between. But the world overseen by God’s good providence is far more of an opulent Oz than a dusty Kansas and the Church which he has gathered from all nations stewards joyfully a kaleidoscopic grace (1 Peter 4:10) . Part of the vision which renews our denomination and carries us forward must be to move beyond this world of paired alternatives not by synthesizing them or holding them in tension but by rejecting their imperious dualism altogether. In its place we must embrace the God who is one and the dazzling multiplicity of the creatures he calls good. In the end, however, what is most notable about the Uniting Methodists statement was the way it genuinely made me stop and think. My experience with our denominational affairs is not exhaustive, but I have not been led to expect a statement of this sort to offer anything more than worn clichés and ready nostrums. Such statements tend either to avoid solid theological argument altogether or rely on slogans calculated to either to congratulate or enrage their given partisans. In the Uniting Methodists vision statement there is real meat. I look forward to dining on it. Because I am a scholar, I have to note that the adjective describing grace here in the original Greek (poikilos) is a far more visual word than the usual translation “manifold” suggests. It is used for all sorts of multi-colored articles of clothing or variegated animal coats, like a leopard’s. Charles “Austin” Rivera is an elder in the Great Plains conference and a Ph.D. student in Ancient Christianity at Yale University. Image: Domenico Ghirlandaio, Saint Jerome in His Study. Is Uniting Methodists a Way Forward? as one of the Uniting Methodists, I have attempted robust theological appeals to what we are about, for instance in http://revjameshowell.blogspot.com/2017/04/jesus-prayer-for-unity-sign-counseling.html – and others. 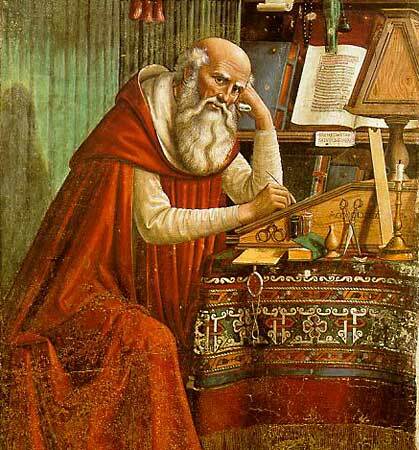 I’m a Ph.D. in Old Testament – and am grateful for your image of St. Jerome, who has been important to me.